It's been 6 days since my first dinner at One Harbour Road (港灣壹號) with the first of two special Pearl Kong Chen (江獻珠) menus, and two days ago we received the devastating news that she had passed on. Apparently the restaurant had thought about canceling the promotion after her passing, but the family felt it wouldn't be what Mrs. Chen wanted - she would have wanted to introduce more people to her recipes and promote old-school Cantonese cooking. For my part, I'm glad they didn't cancel it, because I think the best way to remember her is by being here and enjoying those dishes. Dinner tonight was organized by Susan the Great, and we were joined by none other than Wilson Kwok - Mrs. Chen's godson and the proprietor behind W's Entrecôte. Wilson's presence made things a lot more interesting for the rest of us. I planned my two dinners so that I would be able to take both of the set menus. I also checked against the à la carte menu and found there was one dish that didn't appear on either of the set menus. After getting the nod from Susan, I ordered this as an extra on top of the set. This way I would have gone through every single dish on offer during this promotion. Supreme scholar's deep-fried custard (太史戈渣) - the only overlapping dish between the two set menus, and I can certainly understand why. I still love having this every time, and the presentation was a little better tonight. Stir-fried minced dried oysters, pork, sausages and fungi in lettuce cups (炒雜菌蠔豉鬆) - just look at the presentation... Beautifully trimmed lettuce, and I Love Lubutin thought that my mom would appreciate this attention to detail. Different filling than last week, and the smoky flavors of the dried oysters hit us as soon as the dish arrived. Amazing amount of work has gone into dicing the ingredients... Yummy. Minced partridge broth with chrysanthemums, bamboo shoots and fungi (菊花鷓鴣羹) - no surprise that all the ingredients were finely shredded, just like the famous Supreme Scholar's five snake soup (太史五蛇羹). Apparently this was because Mrs. Chen's grandfather - the Supreme Scholar Jiang Kongyin (江孔殷) - smoked opium and had lost much of his teeth, so the ingredients needed to be thin enough to be eaten without having to chew very much. The origin of this version of the soup apparently dates back to 2003 when Hong Kong was affected by SARS. It was difficult to import snakes at the time, so Mrs. Chen came up with a substitute using partridge. I thought this was pretty nice, although Wilson felt it wasn't thick enough to be a 羹. We were all a little surprised at the dark color of the crispy fried dough... and felt they were fried for a little too much and would overpower the soup. Matsutake sandwiched with shrimp paste (百花松茸夾) - it's not matsutake (松茸) season so the kitchen used pre-sliced dried matsutake, which naturally didn't have the same type of fragrance as fresh ones. Stir-fried breast of duck with young ginger in honey sauce (蜜糖子薑鴨脯) - it only took one little nibble to see that this was no "young ginger (子薑)"... since the flavors were too strong and spicy. We made the comment to the sous chef (since the executive chef had flown to Tokyo for a promotion), who told us that it was still young ginger season (albeit the tail end), but the stock was acquired some time ago. I was also nonplussed about the duck, while others felt it had been slightly overcooked. Steamed chicken skin with shrimp paste (江南百花雞) - this was the extra dish. After steaming, the meat of the chicken had been completely removed and placed with a thick layer of shrimp paste. I was a little disappointed that the dish wasn't presented as a "whole chicken"... and was also hoping for the flowers that gave the dish its name. Gala mix of fungi and vegetables (鼎湖新素) - a lot of different ingredients here... with bean sprouts, bamboo pith, sugar snaps, lotus seeds, lily bulbs, button mushrooms, ginkgo nuts, black wood ears, white wood ears and another type of shroom I couldn't name. The was pretty good, except I found the ginkgo nuts to be pretty bitter, and Da Jam complained of a couple of lotus seeds with their cores left inside - which are also bitter. Almond cream, yellow fungi and egg white (黃耳蛋白杏仁露) - this was really, really good. Perhaps one of the best almond cream I've had. Maybe it was the yellow fungi that made the difference? 2005 Kistler Chardonnay Stone Flat Vineyard - nice and toasty nose, and a little buttery. The toasty nose got pretty heavy later as it opened up. 2010 Wagner Family of Wines Sauvignon Blanc - this was definitely a Sauvignon... with a little pipi de chat. Nice and crispy, with a hint of green apple. 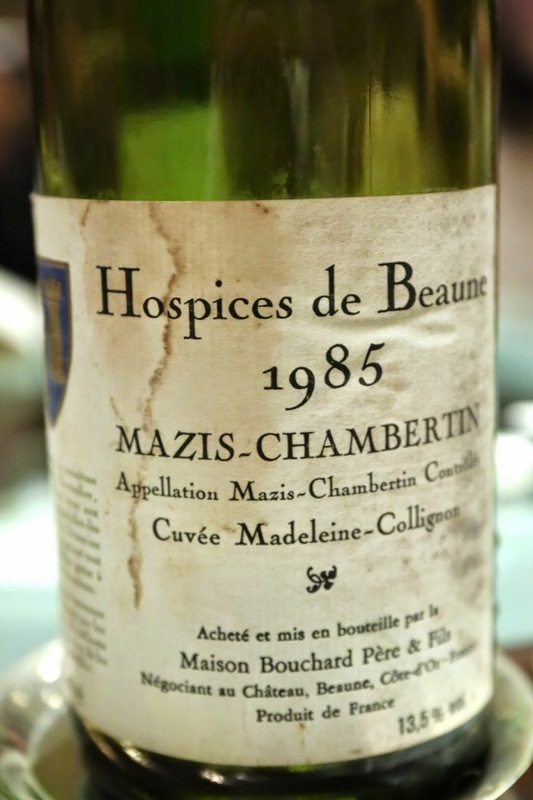 1985 Hospices de Beaune Mazis-Chambertin Cuvée Madeleine-Collignon par Bouchard - decanted just before serving. nose of leather, a little stewed and ripe. Nice acidity. I think the wine is getting tired and going downhill. So I've done it. Been here twice and gone through all the dishes. I'm happy to have done this, and certainly wanted to pay tribute to Mrs. Chen. I hope her recipes are passed on and we can continue to taste these dishes for years to come. Curiously, having spoken to different friends from both dinners, the general conclusion seems to be that the first halves of both menus are much more interesting than the latter halves. For me, the highlights were the two soups which required some effort to prepare, and also the lettuce cups with their finely diced and flavorful fillings. Would I be able to have them again? I certainly hope so. Very sad to hear that she passed away... since I just had lunch there a week ago. Thanks for the recommendation.